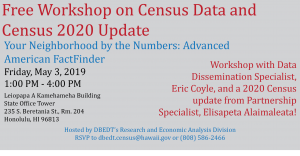 The Hawaii State Data Center (HSDC) is an officially designated source of Census Bureau data for the State of Hawaii under a joint federal-state agreement with the U.S. Census Bureau relating to the national State Data Center Program. The Hawaii State Data Center is a local source that distributes census data; assists the public in the use of census data by providing technical advice; educates the public by providing guides and sponsoring training on census data, products and tools; and maintains a network of affiliate organizations throughout the state. This website provides Hawaii specific census data which are included in various products such as profiles, data highlights, reports and maps. They are available for different geographic areas from the national level to the small areas such as census tracts and blocks, depending upon the data and product of interest. HSDC is a part of the Research and Economic Analysis Division (READ) of the Hawaii State Department of Business, Economic Development & Tourism. Other federal-state cooperative programs within READ include the Federal-State Cooperative for Population Estimates (FSCPE) and the Federal-State Cooperative for Population Projections (FSCPP).